The Mac’s menu bar is a handy place for quick access to apps and system preferences. But it can easily be a crowded space. Your Mac’s menu bar is a useful tool. 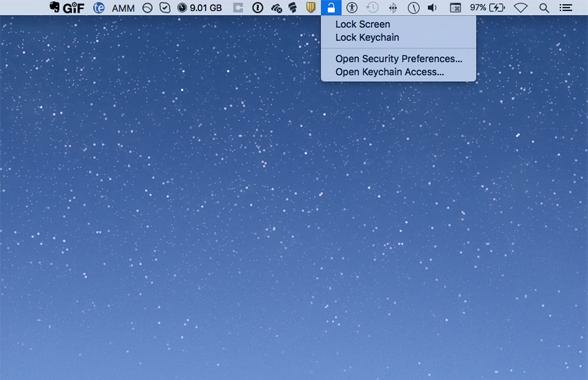 It displays “menu bar extras,” little icons that give you status information about your Mac, or that offer quick-access menus to certain settings. For example, you can click the Wi-Fi icon to turn Wi-Fi on or off, or to select a Wi-Fi network. You can click the User icon to go to the login window, or to select a different user and switch to their account. Or you can click the keyboard icon to change input methods, if you work with different keyboard layouts. It’s not just OS X that puts menu extras at the top of your display; third-party apps do as well. Some offer similar features, such as access to oft-used functions, and others can provide status information. But all this comes at a price: clutter. If you have a Mac with a large display, then you probably don’t worry about how many icons are in your menu bar, though they can give you sensory overload. But if you have a laptop, you may find that not all of your menu bar extras display when an application you run has a lot of menus of its own. App menus get priority, and if you’re working with an app with lots of menus, some of your menu bar extras simply disappear. Here's the menu bar on my 27-inch iMac. Here’s what’s in my menu bar, from left to right: Dropbox, Airfoil Satellite, TypeIt4Me, BusyCal, BitTorrent Sync, HazeOver, Moom, f.lux, Evernote, Plex, then a group of status menu bar extras from iStat Menus. Next come system menu bar extras: Messages, Wi-Fi, Eject, Time Machine, Volume, Bluetooth, Input, User, Spotlight, Notification Center. For system items, just press Command and drag a menu bar extra away from the menu bar to remove it. For third-party items, you’ll need to check the apps that added the menu bar extras. Many of them can be removed, usually from a check box in the preferences or settings. However, some apps don’t let you do this; there would be no other way of accessing settings or features. For example, while Dropbox offers access to settings from its app, there’s no way to pause or resume sync, or to see what’s syncing without the menu bar extra. The $15 Bartender can solve this problem. It allows you to reorganize all your menu bar extras, creating a second bar that only displays on demand. You can also rearrange all the menu bar extras with Bartender, whether they’re part of OS X or come from third-party apps. For third-party menu bar extras, as I said above, each app has a setting, and you may add or remove some of these. To add system items, you need to go into System Preferences. For example, the Wi-Fi menu bar extra setting is in the Network pane; the User extra setting is in Users & Groups; the Volume setting is in Sound; and so on. There are some other menu bar extras you can add, but only if you know where they’re hiding. If you go to /System/Library/CoreServices/Menu Extras you’ll find two dozen items you can add to your menu bar. Double-click any of these to add them to your menu bar. 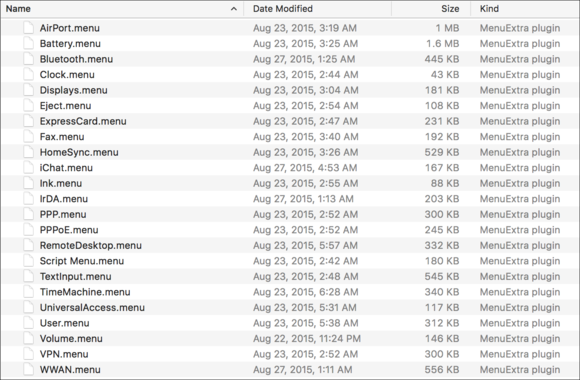 A hard-to-find folder contains a number of useful menu extras. Some of these are available from System Preferences, but not all. For example, I use the Eject menu extra to be able to eject discs from my optical drive; and if you like to use AppleScripts, you may want to add the Scripts menu extra. Menu bar extras are useful, but only if you don’t get overwhelmed. Taking control of your menu bar can make you more efficient, and save you time.